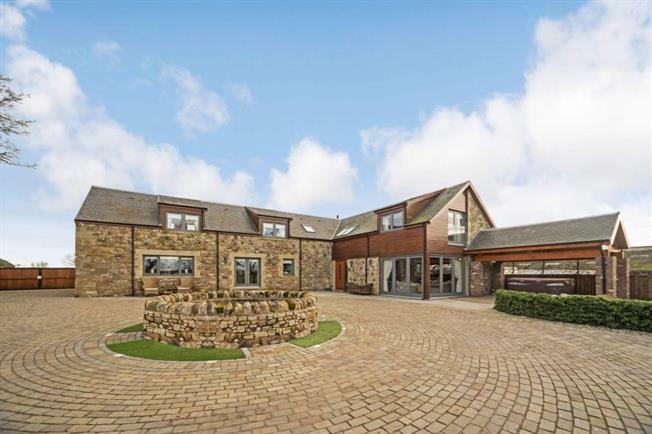 4 Bedroom Detached House For Sale in Lanark for Offers Over £650,000. Tranquil, idyllic and a fabulous peaceful outlook this converted barn has been designed and finished to the highest quality with every minor detail thought through meticulously. The house itself offers the pinnacle of family living over two generous size floors. The entrance leads to the large, grand welcoming hallway giving access to all main apartments on the ground floor with winding oak and glass staircase leading the upper level. The dining size kitchen with integrated appliances including wine chillier, offering excellent family or entertaining space which leads directly to the large formal dining room. For convenience the utility room has access off the kitchen too. The formal lounge has a bright and airy feel having full length bi-folding doors leading into the phenomenal outdoor area which is landscaped over different levels. Completing this level is a further bathroom and snug complete with built in wall fire seen from the grand hall into the snug. On the upper level is found the master bedroom which has double aspects across the gardens and countryside beyond from the Juliet balcony. The master also benefits from his and hers walk in wardrobes with en suite bathroom. There are a further three double bedrooms on this floor all having en suite shower rooms and a WC. The main house is complemented by a fantastic games room above the garage. The garage itself offers parking for up to three cars, with tiled flooring and a workshop / kitchen area. The upper floor has a vaulted ceiling with exposed oak beams. An expanse of glass covers the gable end and also offers stunning uninterrupted views over the surrounding countryside. The room is open plan, with a snooker table, seating area and bar, making this an ideal room for entertaining. There is a WC and store off. An outdoor canopied living space with fire pit, heat and lighting is attached. The games room could be converted to form additional accommodation, subject to the necessary consents. The garden space is entered via electric gates which open up into a perfect winding driveway with centrepiece walled pond. The gardens themselves are mainly laid to lawn with ornamental hedges, mature trees and a stone built wall. There is a summerhouse, stone patio area and a practice putting green. A canopied hot tub has been installed adjacent to the house.